Soon after Felicity Vuolo was born, friends sent Jinger and Jeremy Vuolo a Chicago Cubs onesie and tickets to a Cubs game. For those who are not familiar with sports, the Cubs are a baseball team that broke a 108-year losing streak by becoming the 2016 World Series champions. 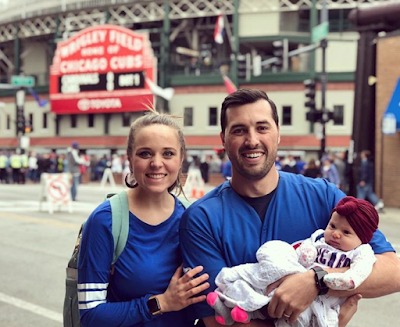 While Jinger and Jeremy are not Cubs fans, their friends are, so they traveled up to Chicago this weekend for a game at iconic Wrigley Field. While not a Cubs fan, ( maybe a little,lol) being from Maine....GO SOXS!!! Love love Wrigley Field!!!!! One of the most awsome places ever!! Hope y'all had fun!!! Went to Wiggly field once. Parking a mess, and it smelled like potatoes. Wiggly field smells like popcorn. Gretta and Alex, its "Wrigley Field", not "Wiggly Field", for goodness sake! Wiggly Field - is that on an active earthquake fault? Watch your step near 2nd base! I thought it smelled like fish. I think more like parmesan cheese. When I was there, it smelled like sweaty people and beer. But this is October, so maybe it want so bad for them. Hope no earthquakes. Just a nice family day at the ballpark. Felicity is lucky to have Jeremy and Jinger for parents, they seem so nice. Such a cute, cute family. That baby is adorable! I'm so sad that the season finale is Monday, but I can't wait to see it. I can't wait until the new season begins for counting on! I absolutely love this wonderful family show! Please make sure that they return to the lineup ASAP! just curious why you would give Cubs tickets to someone who doesn't like the Cubs team? Have you ever noticed that most gifts are something that the giver themselves would want? Think about it. People buy what they're attracted to, even when what they're buying is supposed to be given to someone else. It's hard to take your own desires out of gift giving. This is how all sorts of unused items end up in yard sales! Exactly! Doesn’t make much sense. But I’m sure they had fun. To give them a chance to see a game and become a fan? Or just treat a great couple and new parents to a nice weekend get away. Such a cute family! And as a gift for a new baby and new parents. If someone was giving me free tickets to a baseball game I wouldn’t care what team it was to see! 9.52am I think some people buy gifts they would like but many people like my family and friends put thought into it and for me I often pray about what the gift receiver would like, that certainly takes out my desires of gift giving! I think it is a really fun gift. Although I am a huge Cubs fan, I would hope to make it less about me and more about the couple by giving them tickets to their favorite team and sport. To give them a reason to come visit. I sent Cardinals shirts to my cousins kids in Houston. Maybe the people that gave them the tickets live there and hosted them while visiting. Maybe the gift givers went to the game with them, so it was a chance to see their friends too? A more fitting gift would be a whole day of babysitting while the new parents nap. 9:06, I wouldn’t be giving my two month old fornsomeone to take care of for the day. And Jinger breast feeds Felicity so I’m not sure how well that would work out. @3:18 People leave babies younger than that at daycare or in a relative's care when they go back to work after 6 weeks. You can pump ahead and not miss a breastfeeding. I guess sermons write and deliver themselves while you're gone? And members of the congregation schedule their problems so as not to interfere with baseball games? I've never seen a pastor with so much time off. In the words of the Duggars, "It's amazing!" Negative. You have no personal knowledge of what happens at the church. Churches have people that help and serve in different capacities. Stop judging and be kind. Jeremy is on "Duggar Time" now, lol! Yes! My pastor is NEVER off. Once a year he goes away to see family. He is available 24/7. He has the hardest job I’ve ever known. I don't, for the life of me, understand why people who obviously don't like the Duggars visit this blog. Get a life! It’s amazing and none of your business. Really??? Do you have any idea how many times Ive seen pastors at other churches take time off? It's much more common than you think. A rather snarky comment, jealous much? I know at least for oro small church, the pastor travels a LOT, but the whole congregation is just fine with it because they know that the elders and other members will step up to the plate. It gives other members a chance to step out side their comfort zone and bear the burden of the hard work that pastors do all the time. It also gives our pastor a chance to renew the energy pastoring requires. Not to mention it didn't say he was gone through Sunday. Unlike some other jobs, sermons can actually be prepared ahead of time. Guest pastors can preach. Laymen in the church can help out if there are congregational needs while they're gone. When our pastor is out of town, we miss him very much, but our church doesn't fall apart. Exactly! Our pastor also travels sometimes. He has family to visit, conventions to go to, and is also a sports fan. We have associate pastors, deacons, etc. to help out during these times. Since Pastors work seven days a week, they should get extra time off. The show is a part time job for them, so I am sure the congregation understands when they have to travel for it. Remember that the show is condensing their year down into a few episodes, so they arent traveling as often as it seems. Also it doesn’t count as time off when their families go to see them. They probably aren’t missing Sunday’s at church. Pastors can work on their sermons while they travel too. Duggar in-laws always seem to have jobs with lots of flexibility oddly enough!!! My cousin's wife is a minister and they go on vacations, their kids are in activities, etc. They live a life like everyone else and I often forget she is a minister. Some people spend more time on the job than others. We know nothing at all about Jeremy's job. Is he an assistant? Is he part or full time? Yes, we see their vacations but maybe because he wants to be private about his work. We know only a tiny sliver of what he does. Maybe because he is 'famous', he is in demand to giver sermons or talks elsewhere and that's what he mostly does. I believe in not giving the troll any attention. That is what they are seeking,to be the center of everything. It's good for a minister to have time off. Refreshes the spirit, family time, and helps prevent job burnout. Jinger looks and seems so different now. She doesn't look like she was a Duggar. I wonder why some of the girls don't seem like they changed so much like she did after marriage. Weird! Jinger was probably always like this, (likes fancy clothes, loves the limelight, loves traveling etc. ), But was never allowed to be her true self until she broke free of her family. Jinger has lightened up on the eye liner - she had always used too much - in my opinion - now a more natural look - very becoming. AND when becoming a wife and new mother we mature although she had always seemed mature. The subject of the Duggar daughter’s change in style, especially Jinger, has been EXAUSTED as a subject matter. Some of us get tired of reading the same critiques, for and against, over and over. Time to move it along! Omg what an adorable head wrap! They have sure traveled a bit with the newborn. Is that safe? I have friends whose baby is seven months old and has now been on six plane trips. Their job requires them to travel a lot and he does great with it, not sure what you mean by “is that safe”? They've only traveled to San Antonio and Chicago. Felicity is two months old and it is safe. It's normal for Jinger since the Duggars have always traveled with infants. Did you have the same concerns when Joy and Austin took Gideon on the ski vacation or when you see infants in public? It's perfectly safe, but a hassle to bring all the stuff a baby needs along with you. Actually, it's not completely safe health-wise. Ask any doctor who's treated someone just back from vacation somewhere. You can definitely bring back more than a suitcase full of dirty clothes. Why would that be weird? They are all individuals with different personalities and they will develop in different directions. She’s grown in to her own, good for her! I think Jinger and Jill have definitely grown in a totally different direction but the other married sisters seem to really appreciate and hold true to their convictions they have always had. I noticed the brothers all married girls With the convictions they themselves were raised with. Are you saying that non-Christians have no appreciation for the things in life that they love? My goodness. Cubs fan or not, why would someone give sports tickets that require air travel, hotel, meals to someone who has an infant baby. Not good to travel around and interrupt the baby's schedule....feeding, napping, etc. Not a lot of common sense shown here if you ask me. Psh. Traveling with an infant is cake compared to traveling with a toddler. I say do it now while the baby is still sleeping most of the day and can’t walk. I remember thinking it was so stressful when we took our 6 month old on a long trip. Looking back it’s cute how clueless I was as to what a challenge actually is. I am guessing they stayed with their friends and ate with them, as well. Infants can be great travelers. Leave that decision to the parents! Younger babies can actually be way easier to travel with than older babies. They sleep more, they're really easy to feed (especially if you're nursing), they're easier to entertain and don't want to get down and explore, etc. We just have the baby in mind. Not all decisions parents make are necessarily good ones. Although occasional travel is probably fine. Travel exposes you to a lot of different germs, many of which you may not be immune to because you've never been around them. Airports in particular are dangerous germ-wise for the young, unvaccinated, or anyone with a weakened immune system, due to the volume of people from other places passing through them. This is often how diseases spread county to country. Jinger & Jeremy took a risk. Hope Felicity didn't catch anything. Such a sweet family, the baby is so darn cute. I am so happy for Jinger, marrying and moving away, has opened up a whole new world to her. You can see it in her face, she is so happy and full of life. Jeremy has exposed her to so many new experiences, she is just blossoming. I hope they follow this path and send Felicity to school with other children rather than home schooling, Either choice is fine, but regular school offers opportunities that home schooling does not. Love this couple, they are so wonderful together. Would love to know what opportunities public school offers that homeschool doesn't? Any class, sport, club, or activity done by a public schooler can also be done by a homeschooler. The “opportunities” offered by regular school aren’t ones I want to expose my children to. I taught in a public school for 5 years. If I wanted my kids to learn how to take a test and hate learning I wouldn’t have made the decision to resign and homeschool them. And homeschooled offers many opportunities that public schooling does not. You just need to be in the right community. Homeschooling offers WAY more opportunities than public schooling. Yikes people, I can't even imagine how Michelle and Jim Bob must feel reading your comments about how happy their daughter is now that she moved away from them and got married and looks so happy now that she is exposed to all these new experiences and seems full of life now. I think they provided her with a pretty privileged childhood full of experiences and surrounded by family who loved her. If she wasn't happy about her childhood and feels the need to radically change, well that's not her parents fault it is her fault. I know her parents want her to be happy but not because she got away from them. I actually work as a Learning Support Officer in the Public school system and I also home educated my kids from K-12. My biggest frustration in my work is the limited opportunities the children have compared to what home education offered my children. Most home educators belong to home education networks in which they participate in a vast array of activities, educational experiences and life skills. My second frustration is the lack of ability to give each student the learning time they require one on one. Having worked in both fields I would definitely say home education offers a far more comprehensive educational experience than a school ever could. Homeschooling is a wonderful way to have a strong family. Homeschooling offers lots more opportunities than a 'regular' school. Maybe you don't know enough people who have been homeschooled in order to compare. 6:23- It all depends on who is doing the homeschooling. Just as there are not-so-great brick and mortar schools, there are also homeschooling situations that are far from ideal. What opportunities do you think homeschoolers miss? Homeschool kids are around other (non-sibling) kids all the time. Maybe as the other Anon suggested, you don't know that many people who homeschool. There are hundreds of opportunities for them! Love how she has gained self-confidence after marrying she always had a great eye for style and combined with her new found confidence makes us smile. I personally think Jessa is the most confident out of all the sisters. I never seen her have to morph into someone new to be happy. The girl just knows who she is, likes who she is and it shows in her life and in her happy little sons lives and husbands life. I always admired how she held to her convictions in all areas of her life before and then after marriage. I think that is awesome! I don't think Jessa is that confident outside of her family. During the scavenger hunt Ben designed for their engagement, she seemed apprehensive when out in public and made Jinger approach the people holding the roses. She was also quiet and not her usual self when with Flame and his friends. She seems to thrive as the big fish in a small pond and becomes shy in larger social situations. She is content in the life that she built for herself and that it wonderful. Jinger is more naturally outgoing, even if she previously seemed unsure of herself. We've seen her in different situations with people outside of her family, including the day when they worked at the coffee shop, and she has people skills and a warmth in connecting with others. She also always had a distinct style even when growing up. Her experiences as a pastor's wife in Laredo have helped her blossom and hold her own. The only conviction I've seen Jinger deviate from how she grew up is wearing pants and, even with this change, she continues to dress modestly. She hasn't morphed into a whole new person. Jinger looks extremely happy in the life she is building with Jeremy and that is also wonderful. One size doesn't fit all even if you grow up in the same family. Anon 3:05 When I said that about Jinger it wasn't to be mean. I am from a family of 12 and I am one of seven sisters and some of us including me were the Jingers in our family. The ones that moved away, changed the way we dressed and lived mostly around New found friends and then in a few years life hit hard in different ways and here was our one sister the Jessa among us who stayed true and steady to the way we were raised. She has a confidence in who she is and is like a warm hug and a reminder to us that life isn't all about new experiences and fancy dressing and the limelight, but it's about God and family and being content in and where God called us. She has such a beautiful peace about her and needless to say we are one by one becoming more like her. Jesse seems like her. 8:35 - I think where I'm stuck is that I don't see Jinger changing her convictions other than wearing new clothes. Even then, there isn't anything immodest or necessarily flashy about the way she dresses. The Vuolos live a life centered on God and spreading his word as Jeremy is a pastor and they spend their lives serving the Lord in Laredo. God called Jeremy to the ministry and He brought Jinger and Jeremy together. Jessa was even the one to be their matchmaker. Moving to a new place doesn't mean they aren't Christian or that you can't stay true to the way you are raised. It also doesn't mean that they don't love or value their families. New experiences can strengthen your love of the Lord as you face triumphs and unexpected struggles. Facing challenges can happen anywhere you live as we saw a few years ago with the Duggars. I also don't think that Jinger seeks the limelight any more or less than Jessa does. TLC focused on Jessa as she entered her courtship, her wedding, when she and Ben were the first couple to go an international honeymoon, and when she had her two boys. Jessa also serves as the shows narrator. It's just that Jinger is being focused on now because it was the birth of her first child. Jim Bob and Michelle welcomed cameras into their home, were they then seeking the limelight? I love the way you write about Jessa's contentedness and how it is like a warm hug. It reminds me of Beth from Little Women. However, I think that many times the Lord does call us towards those new experiences. I also think that Jinger exudes joy and genuinely looks content in the life that she has with Jeremy. Well said @8:35pm. I agree with you. Anon 8:35 Well said and I have seen that exact scenario played out in people's lives. Godliness with contentment is great gain. Lifelong Cubs fan, and this makes me so happy! Go Cubs Go! What's up with the big heavy hat and mittens on Felicity? It’s a head wrap and they’re really not heavy. Baby mittens are to keep babies from scratching themselves, and before anyone says you can just cut the baby’s nails, that can sometimes be hard with a newborn/young baby. They are in Chicago and it was in the 60's on Friday. 4:35PM: It's been cold outside...even colder to someone from Texas! Mittens to prevent her from scratching herself and the hat for style and to keep her body temp up, heat escapes from your head and feet. Who knows. Jinger and Jeremy don't seem to be dressed for chilly weather. It might be a bit chilly in Chicago, especially compared to the heat of Texas. Plus, mittens keep a baby from scratching themselves in the face and Felicity isn't the only baby I've seen with the head wrap on. She's simply adorable. Also, what Jinger and Jeremy choose to put on their baby, is their business. Chicago is a windy city. It's almost fall, so the baby could afford to be wrapped up a little. It's almost fall? Not what my calendar says. We're about a week and a half past the autumnal equinox. Lovely family. The show will be back. TLC had Season Finale. If it were cancelled it would say Series Finale. Did their friends also give them 2 plane tickets, a hotel room, a rental car, and meals? Seems odd to give someone a gift that ends up costing them money. Maybe the friends live there, and they were going to stay with them. They could have been planning to go see them and the tickets were just an extra bonus. Unless they planned the trip for other reasons. Come on = TLC KNOWS we fans enjoy Jinger/Jeremy news - the camera crew was most likely there znd may have picked up the expense! Maybe their friends live there and they stayed with them. Maybe they had frequent flyer miles. Seems odd to nitpick for things to criticize about a gift someone gave someone else. Would have been nice to meet up with you all here in Chicago and get some Christian guidance from Jeremy and Jinger. Why, aren't there any Christians in Chicago? Not much on the south side!! More guns than Christians!! Pray for Chicago peace!! I'm sure there are Christians in Chicago. I don't think they were trying to imply that there aren't any. They just said they would like to have met and talked to them maybe. I know, I feel the same way. Jeremy seems so kind and approachable. I bet he's a great minister to his congregation. Jinger and Jeremy both seem very caring and kind, calm. Very suited for their work. Sweet picture of some precious people! Jinger & Jeremy. I think y'all are both amazing parents. Don't let the haters tell u How to raise your beautiful daughter. God Bless you all.